When my brother-in-law called me out and signed me up for my first marathon five years ago, I immediately grabbed a hefty stout out of the fridge. “I guess this will be the last of these I have for a while,” I told my roommate, assuming my beer-drinking days were on hold until I crossed the finish line. My roommate was an experienced marathoner who paced the Bank of America Chicago Marathon and qualified for Boston. When he told me I could still enjoy my IPAs and indulge in pancakes and eggs on a regular basis, I heartily accepted his wisdom. The training still intimidated me—I’d never run more than five miles in my life—but his assurance that I wouldn’t need to eat like a bird for six months made diving into marathon training more enjoyable and less scary than I’d imagined. 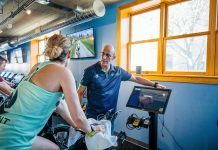 We all have our fears when it comes to physical challenges, but with the season for resolutions upon us, Chicago Athlete set out to get advice from experts on some simple steps to move you past them and on to new accomplishments in the year ahead. Rock climbing might be one of the most intimidating physical challenges out there. Take all the strength, patience and endurance needed to run a race, top it off with a healthy dose of fear, and it’s easy to see why you’d be afraid to knock this off your bucket list. But rock climbing isn’t as scary as it seems when you’re watching an Alex Honnold video on YouTube. Brian Carver, a trainer at Equinox in the Loop, says it’s easy and safe to get started. He suggests you start by hitting a basic class at a climbing gym. You’ll also be strapped into a harness and use a belay device, a clamp that slows down and stops the rope when a climber falls, mitigating your greatest fear. Carver says it’s not hard to make friends once you’re in the gym. Carver started climbing four years ago by going to a gym and taking a basic class. In the time since he has traveled around the country to climb, and figures he’s five years from his goal of climbing El Capitan. While that may not be on your horizon, once you hone your skills in the gym you can head three and a half hours northwest to Devil’s Lake State Park, a great first outdoor foray for beginning climbers. You’ve finished a marathon, maybe even a triathlon, yet you’re awed by a skinny-jean-clad, single-speed-riding, no-helmeted beard flying down Milwaukee Avenue with traffic at rush hour? You’re not alone. Many dedicated athletes fear biking in the city: a fear that costs them easy exercise and hundreds of dollars in extra parking fees and fuel-ups. While that hesitation is understandable, Emily Leidenfrost, program manager at West Town Bikes, says a confident rider is a safe rider. Leidenfrost says those new to the city should start with side streets, which have lighter, slower traffic. Start by getting a printed copy of the Chicago Bike Map. Lay it out and study it to get a lay of the city’s bike routes. You can find it at many bike shops and public libraries throughout the city. The fear of finishing last in a race can be enough to keep some people who run for exercise from ever registering for a race. If only they saw the range of bodies in the starting corral at a race, they’d realize the odds of even being near the back of the pack are pretty slim. So you’re not going to finish last, but how do you get started? Hipp suggests finding a running group or a friend to run with once a week. They’ll hold you accountable and give you a brain to pick as you encounter the inevitable hurdles that come with training. 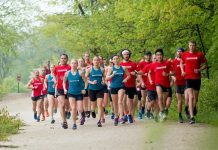 Visit cararuns.org for an array of resources for beginning runners, including upcoming races, running terminology so you can understand your first conversation with fellow runners at the bar and tools to help in your training. Local running stores offer group runs multiple times per month, as do local clubs and groups. Have you wanted to run a marathon for years, but the thought of 18 weeks of training, not to mention the 26.2 miles at the end, sends shudders through your knees, calves, and ankles? You can choose among hundreds of training plans for runners of every level, but no right or wrong plan to choose, Hipp says. People get to the finish line in different ways. “Whatever you choose, follow the script, do the work and you can do the race,” he says. And as I learned, training for a marathon does not mean sacrificing everything fun, delicious, and hoppy for half a year. Sure, you’ll set yourself up for greater success if you ditch the late-night benders and stick to a smart diet, but you can still enjoy your brew of choice, still eat real food and still have fun. Find a running friend to talk to through your struggles, or join a weekly running group where others can help you gauge progress. With unfamiliar equipment and the chance of skiing near those with more experience, cross country skiing can seem intimidating. You can start by hitting some of the easy trails at area country clubs that let you ski when the snow gets deep, such as Sportsman’s Country Club in Northbrook, Sagawau Environmental Learning Center in Lemont, Heller Nature Center in Highland Park and at Arrowhead Golf Club in Wheaton. You can also ski with a view of the city skyline at Northerly Island. If you do want to go all in from the start, a full kit of skis, poles, boots and bindings will run you only $300, less if you wait until March when stores clear out inventory. For the best groomed trails, drive one and a half hours north to Kettle Moraine State Park in southeast Wisconsin, where the trail fee is just $15. Does the fact that you can’t touch your toes make you reluctant to hit the yoga studio? Sharon Steffensen, editor of Yoga Chicago magazine, says you don’t need the flexibility of a gymnast to feel comfortable in the studio. “Anyone of any body size, shape or flexibility can do yoga,” says Steffensen, who has been practicing yoga for 47 years. Steffensen says those new to the practice should be willing to ask questions and start slow. Find a beginners class that won’t tug at your competitive instincts and will allow you to learn technique and get comfortable with the movements.